This geocache is one of many in this Ministry Area, we hope to have one in each of our 11 churches. 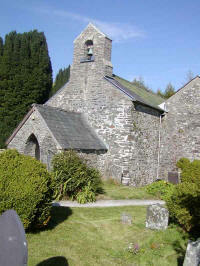 St Michael's Llanfihangel Rhos-y-Corn is a delightful old church in the Brechfa Forest, on an ancient pilgrims trail and is part of the Quiet Garens Trust. You will be looking for a cache with a view! The oldest part of this church was built in the 13th century. The second nave was added c. 1500. The church is set high on the mountain and it lends itself to a quieter meditative style of worship. The church is surrounded by beautiful woodlands, farmland and valleys. Llanfihangel Church is developing its ministry to visitors and tourists through the labyrinth, refreshment table and prayer pebble pool. To this end we have displays of some of the things we do in the church and displays to aid prayer and meditation .Historically, Llanfihangel was a place of pilgrimage. Pilgrims climbed the steep 'Rhipyn seimon' hill and would kneel to pray on a large flat stone from which they could first see the church. The fields around became known as 'Cear Paderau Bach' the fields of little prayers. Note: there are toilets available behind the church hall. This cache is placed on behalf of the congregation who welcome you warmly to their church. They would love you to sign their visitors book and add a 'GC' so they know you've been for the cache! Gnxr n crj, rawbl gur ivrj.